32 acres, 8 ponds. Two of these hold water all year round. A third one holds at least a puddle of water in its deepest part, most summers. The others are shallower, and by design, go dry anywhere from late spring to late summer. Also included is a wet meadow area that remains saturated for a few days to several weeks after rainy periods. 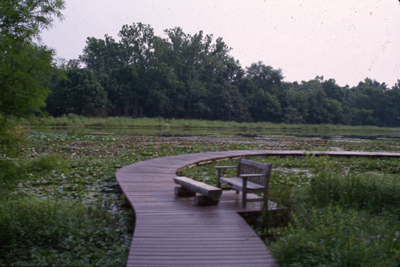 A 300-ft boardwalk passes through rich and then swampy woods, then opens out onto the lily-studded pond. The variation in hydroperiod (duration of wetness) provides a variety of aquatic habitats that accommodate, on the one hand, fish that need water all year round, as well as frog and dragonfly species that have a larval stage lasting longer than one year; and on the other hand, amphibians (salamanders, toads and smaller frog species) as well as aquatic insects that mature in a single season, all of which are sensitive to the presence of fish and bullfrogs, which prey on them. The wet meadow and swamp areas provide habitat for a variety of plants not found in abundance elsewhere on the Reserve. The wetlands were originally conceived by the major private donors to the project as a means of diversifying birding opportunities at Shaw Nature Reserve. Wood ducks, hooded mergansers, green herons, belted kingfishers, and of course, Canada geese are water-associated birds that regularly breed around the Shaw Nature Reserve wetlands. Great blue and (usually immature) little blue herons, and occasional other wading birds forage there. Blue-winged teal, shoveler ducks, solitary sandpipers, snipe and occasional others are notable migrant visitors, especially in late winter/spring. The prairie, with scattered trees that constitutes the watershed for the wetlands and through which the Wetland Trail proceeds from the Loop Road parking area out to the boardwalk, abounds in a variety of sparrows, indigo buntings, northern yellowthroats, blue-winged warblers, orchard and Baltimore orioles, bluebirds and various woodpeckers. The prairie plantings of the wetlands’ watershed are some of the most diverse at Shaw Nature Reserve. They are notable for the increasing abundance of spring flora, including lousewort, paintbrush, downy phlox, blue-eyed grass, yellow stargrass, shooting star and wild hyacinth. The wet meadow and pond edges are home to numerous rare sedge and wetland grass species, and broadleaf beauties such as blue flag iris, queen-of-the-prairie, bunch lily, blue bottle gentian, and three members of the parsley family which require “wet feet”, water parsnip, water hemlock and cowbane. The swamp forest hosts maturing plantings of bald cypress, water tupelo and overcup oak, with an understory of corkwood, swamp loosestrife (the native one, of course! ), and two species of hibiscus, underlain by carpets of lizardtail, water pepper, pickerelweed and copper iris. Spring - Frog songs and migrant waterfowl. Mid-spring to mid-summer - Water lilies and songbird activity. 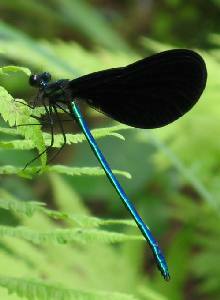 High summer - Dragonflies and singing insects. Mid-summer to early fall - Tall, flowering plants. BEST SEASON – EVERY TWO WEEKS! This area can be easily accessed from the Gardenway Bus Stop parking area and walking along the one-mile loop wetland trail, #15 on the Shaw Nature Reserve map. 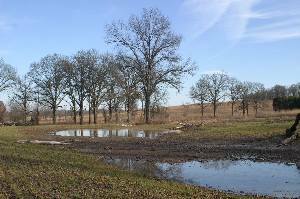 This 20-acre area of former hay field has been modified in three phases by earth moving machinery into a complex of 8 ponds of varying depths (1 to over 8 feet) and duration of wetness (from winter-spring only to all year round). Ponds were dug in 1991, 1993 and 1996, and a rich variety of wetland vegetation was introduced into them, mostly by sowing seeds onto bare ground or into the water of the rainwater-filled ponds. 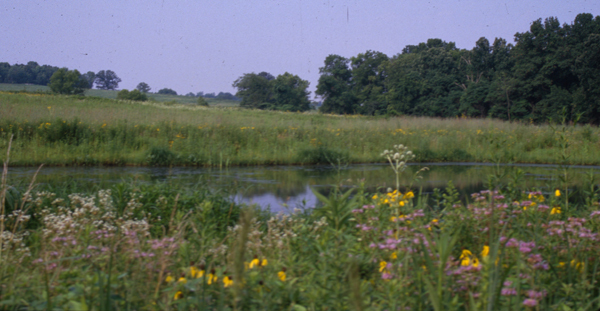 The 60-acre upland area that provides the watershed that fills and replenishes the ponds is mainly a planted tallgrass prairie, with drainages of open woodland. The entire complex is managed by monitoring and control of invasive species (especially sericea lespedeza, (L. cuneata)), brush mowing, and prescribed burning on a 2-3 year interval. Amphibians, birds and aquatic insects thrive among the diverse wetland vegetation, while prairie and savanna flora and fauna abound in the nearby uplands. The wet meadow is a low, flat and poorly drained portion of the wetland watershed (best seen looking west from the observation blind) that was low and wet before any of the other construction in the wetlands area took place. Each spring, peeper and chorus frogs used to sing from its swales. (Since the construction of the deeper, more reliable water sources nearby, the frogs have moved to them.) The meadow has provided a unique opportunity to restore wet prairie vegetation to Shaw Nature Reserve. 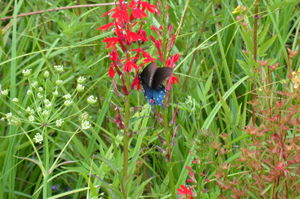 Species such as bottle gentian (Gentiana andrewsii), white turtlehead (Chelone glabra), stiff cowbane (Oxypolis rigidior), swamp lousewort (Pedicularis lanceolata) and numerous sedges (Carex spp.) grow here in abundance due to the frequent but shallow (<2 inches) inundated conditions. The Observation Blind can be reached from the Gardenway Bus Stop parking area and walking along the one-mile loop wetland trail, #15 on the Shaw Nature Reserve map, turn left after you cross the bridge. Five ponds are scattered throughout the grounds. The Pinetum Lake, located between the Visitor Center and the Whitmire Wildflower Garden, is a collection of conifers planted between 1925 and 1927. Driving around the .8 mile Pinetum Loop Road, which is open to cars daily, you will see signs identifying groups of conifers. At the center of the Pinetum is the four-acre Pinetum Lake. The rolling meadows of this park-like area are covered in thousands of daffodils in early spring. Groves of evergreens dot the landscape and beautiful, majestic bald cypress reflect in Pinetum Lake. The conifers include magnificent Norway Spruce, Bald Cypress, and graceful White Pine grouped to form pleasant vistas throughout the rolling landscape. Accent plantings of Dogwood, Redbud, and Magnolia are interspersed among the evergreens. In spring, thousands of daffodils bloom throughout the Pinetum meadows, to be followed by Ox-Eye Daisies, Butterfly Weed, and other native and exotic wildflowers. Many species of birds are attracted by the conifers, as well as gray and red fox squirrels. A profusion of insects inhabit the meadows. Pinetum Lake teems with several species of frogs, fish, turtles, water snakes, crayfish, and minute and microscopic water life. Wolf Run Lake, the largest lake, is a tranquil resting place at the midpoint of Wolf Run Trail. Native upland forest, portions once cut-over for farming, frame the lake and are mirrored in the water. Broad-leaved cattail grows in areas around the pond, a factor in natural pond succession. Animals and birds are attracted to the lakeside. The water abounds with frogs, turtles, fish, snakes, and insects. Wolf Run Lake is north of the Serpentine Wall, #16 on the Shaw Nature Reserve map, and can be reached by walking north from the Gardenway Bus Stop or by walking the one-mile loop Wolf Run Trail from the Visitor Center. Pot-Hole Lake, located near the north and lower boundary of the Tallgrass Prairie, enhances the view from the Prairie hilltop and is an interesting community of itself. Fish and pond life can be observed; animals and birds are also attracted to the water. Pot-Hole Lake can be accessed by parking at the Gardenway bus stop, #14 on the Shaw Nature Reserve map, an walking south on the Prairie Trail towards the observation deck. Mirror Lake is the place to find large catfish and many species of pond life. 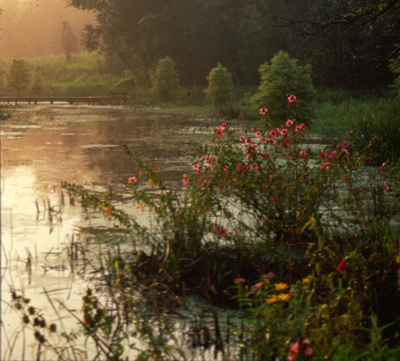 It is a small, round pond, set in the rolling meadows, north and east of the Trail House. Surrounding trees are mirrored in its calm surface. Nearby plantings of Narcissus make this a scenic area in spring. The Trail House Loop Road goes past Mirror Lake as you leave the Trail House, #8 on the Shaw Nature Reserve map. Two ponds, partially surrounded by forest, near Brush Creek Trail between the creek and the prairie are the most recent additions to Shaw Nature Reserve's wetlands (2005). These were built to mitigate damage done to wet woodlands during construction of the nearby Brush Creek Sewer Line. Initially rather open, these wetlands will eventually be shaded by a forest of moisture-loving tree species such as swamp white oaks, bur oaks, pin oaks, river birch, honeylocust, ash and sycamore. Such wetlands provide breeding habitat for wood ducks, hooded mergansers, ebony jewelwing damselflies (photo to left) and many less-known organisms. Not only will these seasonal pools provide additional acreage and diversity of wetland habitat at theNature Reserve, but the sewer line itself (lying about one half mile to the north) will relieve the pollution pressure on Brush Creek from failing septic tanks and leach fields upstream. Also, bare ground in the portion of the sewer line easement that traverses Shaw Nature Reserve is being converted to diverse native grassland. This area is adjacent to the Dana Brown Overnight Education Center, #17 on the Shaw Nature Reserve map, and can be reached by walking south from the wetland boardwalk at the east end of the wetland trail. A system originally developed in Europe for cleaning excess nutrients from waste water of dairy barns and corporate buildings has been adapted at Shaw Nature Reserve to processing gray water from the septic system of the Dana Brown Center. 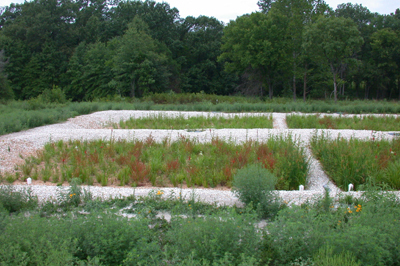 The subsurface flow wetland consists of lined cells, filled with 2 feet of clean gravel and planted with a diverse mix of fine-rooted, native wetland plants. Gray water enters the upper cells through perforated pipes, and flows through the gravel. Complex nutrients in the water are rapidly broken down to smaller chemical components by bacteria in the gravel and on plant roots, thus providing the elements necessary for rich plant growth. The water next flows through a second pair of cells for further cleansing. The water emerging from the outflow of the lower cells is clear and flows into a pond down-slope. As evidence of the effectiveness of this septic purification system, the pond which receives the outflow is never "scummy", and supports abundant aquatic animal life.